17TXLTZ had the most liked content! Mine did the same....did as mentioned before. My fix was, I just got a micro fiber cloth (black to match black leather) and cut about 2-3 inch wide strips and stuck them in between the seat and trim...it wasnt a pretty fix, im sure i could have made it look better, but I just wanted the squeak to go away LOL...now, no squeaks! Hi All! Hopefully I can get some input on this...i tried my best to search but could not find something close to this. To make a long story short, I had of list of issues for the dealer to fix. So I went ahead and took my truck in. Some of the problems being.... 1.) Customer states steering wheel feels loose. Has play if you move it back and forth. -Steering column was replaced, part # 23381950 & #23447442 2.) Customer states the steering wheel heater only heats one side of the steering wheel. -Steering wheel has been special ordered and has now arrived at dealer Anywho, since the steering wheel was a special order part, I was asked to pick up my truck some evening last week, as I drove off, the dealer service closed and later on my trek home, I notice my steering wheel was off about 1-2 degree to the left. The steering returns to center normally, but I need to hold it to the left about 1-2 degree for the truck to actually drive straight. Its a pretty noticeable difference aesthetic wise. I called the next morning just to let them know. Well I just received a call from the dealer that my steering wheel has arrived. and for me to drop it off Monday. I once again reiterated that the steering was off and if it would it be addressed when I dropped it off. I was give the service manager spill that the steering column only goes on one way and there is no way they affected the steering. That they would take a look at it and I would have to pay out of pocket...just trying to make sense of this. Would any of those replacement part possibly could have affected the steering wheel position? This vehicle is the first one I would be keeping for a while, and certainly the first one that I've had any steering components replaced. Just would want to get second thoughts about this. I am going to go in with a positive attitude Monday morning to drop it off. But I find it hard to believe I need to pay for an alignment that I know for certain was fine when I dropped it off that particular day. Mine was shuddering for quite a while...did not think much of it until recently as I am quickly approaching 36K...im at 28K so thought i'd take it in. Torque Converter Failure, DOC # PIP5504A is referenced in the documentation. "....Per bulletin, proceded to removing trans pan and inspecting for excess debri, found significant debri from torque converter clutch desintegrating"
Not sure where you are buying...I traveled from Houston to Dallas 3 times already for 3 purchases. First for my 17 CC LTZ, Second for my father-in-law's 18 CC LT Z71 and just recently for my brother's 18 CC LTZ. All for about 30% off. Dealers in Houston are smoking something, or just want you to haggle with them. The dealer in Dallas is no haggle. All 3 of us have driven out for about 37k. I used to have the same issue, took it to the dealer with no luck. I tried the following and its been working ever since. Go to your home screen on Mylink. Click and hold on any icon as if you're going to move it. Once the option to move come up, move the projection (carplay/android auto) icon onto your favorites at the top of your screen. Once it is there, you should be able to access the carplay from the radio screen. I've ran into the issue that the carplay logo comes up, but i can not access it from the main screen for some strange reason. So i will go into my Nav screen or Radio. Then i click on the carplay favorite icon and it comes right up. And works fine after that. Dealer could never duplicate my concern, as always. 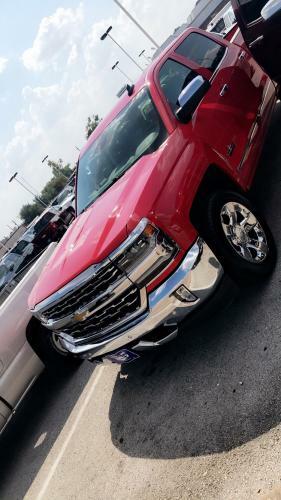 2019 Silverado Hitting the lots!! Already got myself a policy as I always do for the days I will be down there, thanks for the heads up though! Went to the dealer and got an oil change, they checked the brakes as part of the muli-point inspection...looks like everything is good to go! I imagine that is what happened, I had actually just returned that day from my part of the country to my finances city...mine is nothing but dirt roads, I assume they got caked in dirt and mud and sad, hopped onto the toll roads with nothing but hills and braked like crazy and ended up burning them out.